The one who holds the seven stars in his right and walks in the midst of the seven gold lampstands says this : " I know your works, your labor, and you endurance, and that you cannot tolerate the wicked; you have tested those who call themselves apostles but are not, and discovered that they are imposters. Moreover, you have endurance and have suffered for my name, and you have not grown weary. Yet I hold this against you: you have lost the love you had at first. Realize how far you have fallen. Repent, and do the works you did at first. Otherwise, I will come to you and remove your lampstand from its place, unless you repent. But you have this in your favor: you hate the works of the Nicolaitans, which I also hate." "Whoever has ears ought to hear what the Spirit says to the churches. To the victor I will give the right to eat from the tree of life that is in the garden of God." The church in Ephesus (2:1-7) was commended for its hard work and perseverance. The church encountered much spiritual opposition from the temple of Artemis as well as from the fourteen or more other Greek deities that were worshipped. 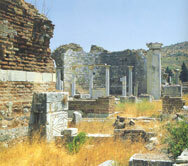 Ephesus was also a center of magical practices (Acts 19:19). False apostles in the church were also a problem. At Miletos St. Paul had warned the Ephesians elders that some from their own company would distort the truth (Acts 20:29-30). Timothy was to make the Ephesians Hymenaeus, Alexander, and Philetus stop teaching false doctrine (1 Tim. 1:3, 19-20; 2 Tim. 2:17-18). The victorious Christians in Ephesus were were promised to eat of the tree of life in the paradise of God. Paradise was the name for the Garden of Eden in the Greek Old Testament. Outside Ephesus was the grove Ortygia which was thought to be the traditional birthplace of Artemis. The sacred grove called a paradeisos still drew pilgrims in the first century. The Christians were thus promised an eternal paradise far superior to that possessed by their pagan counterparts.